How is your week going? I know I've been a little MIA on the blog and on instagram, but that's because things have been a little busy over here at our new house! The problem is, I have had so many ideas for recipes and videos and fun blog posts but just have not had the time to crank them out. When I'm not working I'm helping Kyle with renovation things, and when I'm not doing house stuff, I'm walking Sibbie or playing with her. So far she is adjusting to the new house and neighborhood pretty well. I think she enjoys the space and the backyard, although most of the time she still hangs out near her crate and the large windows/sliding door in our living room. Such a rough life! An area I hope to get better at (and post more of on here) is cocktail recipes. I have never been interested in playing bartender at home because my knowledge of cocktails/wine/beer is very limited. I also don't drink that much and when I do I prefer dry or fruity red wines or cocktails with gin or vodka. I've never really understood what makes a good drink good, but I want to change that, especially since we have the space now to have a better stocked bar area and can entertain more! One drink I definitely have a feel for though is margaritas, especially frozen margaritas! If you live in San Antonio (or surrounding Texas areas) there's a good chance most restaurants sell a version of it. This was something we immediately noticed while living in NYC--not many places sold frozen margaritas! The hibiscus syrup in this margarita is a game changer. It adds a floral note to the margarita but is not overpowering. It also makes it this beautiful purple/pink color! How would you describe it—magenta? Let's call it magenta. I made them again for some friends recently and they were completely obsessed! Do yourself a favor and make these for home happy hour this week. In a small saucepan over medium high heat, combine the water, sugar, and dried hibiscus flowers. Heat until right before boiling, stirring until the sugar is dissolved. Transfer to a bowl and let cool in the refrigerator for 1 hour. Strain the liquid through a sieve and discard the dried hibiscus. 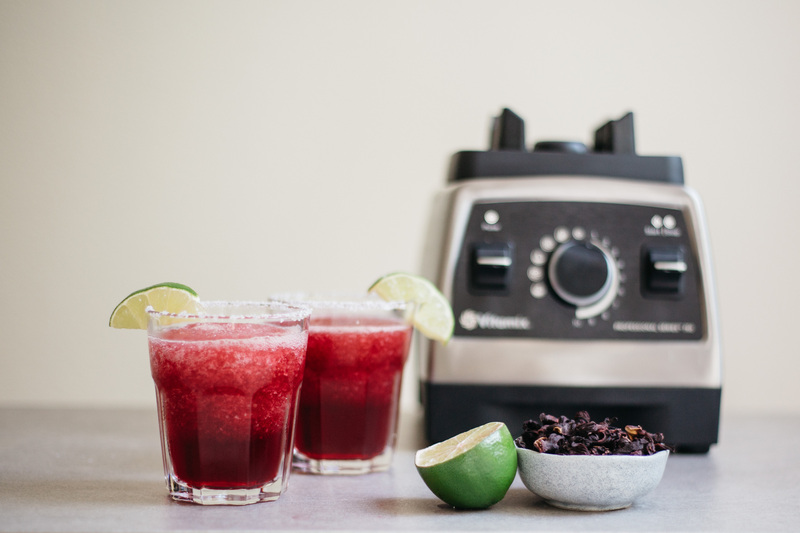 In your Vitamix Personal Cup Adapter (or other high speed blender), combine the ice, hibiscus syrup, lime juice, tequila, and triple sec. Blend on low and slowly increase speed to high until ice is fully blended. Add more ice if needed for a smooth blend. Garnish glasses with salt rim and a lime wedge, and divide margarita mixture evenly between two glasses. Enjoy immediately!